Fox Hill Farm's Omaha Beach got the jump on Improbable in the run down the backstretch under Mike Smith, then held off that rival to win Saturday's $1-million, Grade 1 Arkansas Derby at Oaklawn Park in Hot Springs, Ark., by one length as the 8-5 favorite. Trained by Hall of Fame conditioner Richard Mandella, Omaha Beach covered 1 1/8 miles on a sloppy racetrack in 1:49.91. The War Front colt out of Charming, by Seeking the Gold, was winning his third consecutive race and second Oaklawn stakes, having defeated Game Winner in a division of the G2 Rebel on March 16. 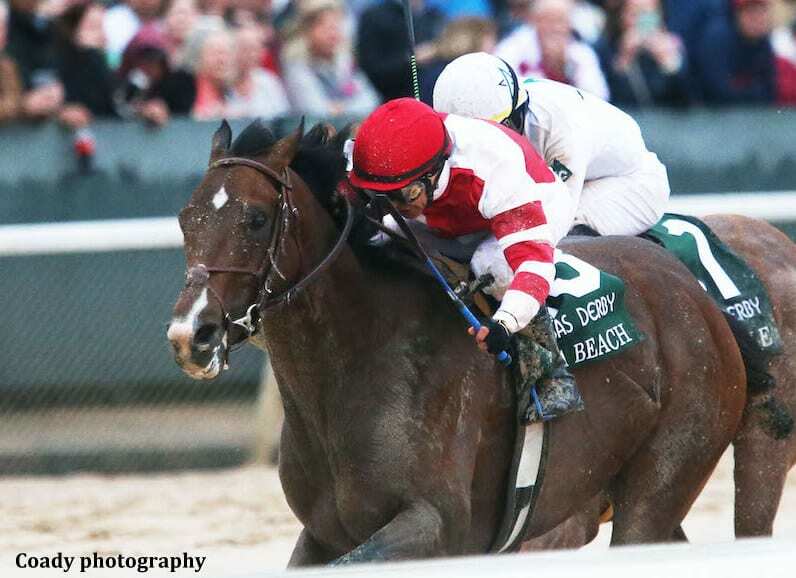 In the Kentucky Derby points race, Omaha Beach assured himself a spot in the starting gate by earning 100 points, with Improbable's 40 points for second giving him a total of 65 and putting him 11th. Country House earned 20 points for third and now has 50, putting him at No. 17 after the final points race of the season. Improbable, getting jockey Jose Ortiz for the first time and adding blinkers, drew the No. 1 post position and was fractious in the gate as the Arkansas Derby starters were loaded one at a time. After the final horse entered the starting gate, Improbable acted up again, and was backed out of his stall, then reloaded. When the gates sprung open, Improbable broke well but so did Omaha Beach from post position 3. Both favorites were outrun to the first turn by the three outside horses, with Calvin Borel aboard One Flew South making the lead from the 9 post while in hot pursuit byJersey Agenda (10) and Long Range Toddy (11), winner of the other Rebel division over Improbable. After an opening quarter mile in :23.08, Smith switched Omaha Beach to the outside, and they made a strong move to the front in the run down the backstretch. After a half mile in :47.50, Ortiz moved Improbable up from sixth position and reached contention after six furlongs in 1:12.46. As the field rounded the far turn and into the stretch, Omaha Beach and Improbable separated themselves from the field. Improbable ranged up alongside Omaha Beach, but Smith had something left, never letting the Bob Baffert runner put his nose in front. Omaha Beach was edging away in the final sixteenth to secure the win. Hall of Famer Smith now has an interesting choice for the Kentucky Derby, as he also rode Baffert-trained Roadster to victory in the G1 Santa Anita Derby on April 6. Mandella, 68, has run six horses in the Kentucky Derby, beginning with Bedouin in 1984 and most recently in 2004 when Action this day finished sixth and Minister Eric 16th. His best finish came in 1994 when Soul of the Matter finished fifth behind Go for Gin. This was his first victory in the Arkansas Derby. Baffert, also a member of the Hall of Fame and a five-time Kentucky Derby winner from 29 starters, will likely have three horses in this year's Run for the Roses on May 4: 2018 2-year-old champion Game Winner, second to Roadster last out in the Santa Anita Derby; Roadster; and Improbable. Smith has two Kentucky Derby wins: Giacomo in 2005 and Triple Crown winner Justify in 2018 for Baffert. This entry was posted in NL Article, Triple Crown and tagged arkansas derby, Bob Baffert, Horse Racing, improbable, jose ortiz, kentucky derby, long range toddy, mike smith, Oaklawn, omaha beach, richard mandella, road to the kentucky derby, thoroughbred racing by Paulick Report Staff. Bookmark the permalink.